We left home early in the AM in an effort to arrive at the Venice Rookery before sunup. The drive took about one hour and we arrived just a little south of the sun peeking over the horizon. We were a little skeptical driving in because the Rookery is located in downtown Venice, Florida just about a quarter-mile off the main drag, Tamiami Trail (US 41). However, it was relatively easy to find from the Jacaranda Boulevard exit south off Interstate 75, being the first left turn (beside a Florida Highway Patrol Station) after going north on Route 41 about 1 block from where it intersects with Jacaranda. We were the first car in the parking lot and could not believe our eyes as we looked into the rookery area. The rookery - the Venice Area Audubon Rookery - is an island centered in the middle of a small lake. About 70% of the lake is surrounded by vegetation and native plant growth. The remaining area is open to viewing, and has a well worn path, obviously trod by many feet in an effort to view this wonderful spectacle. Only minutes after our arrival other bird lovers began to arrive, all carrying some array of cameras and tripods. The mood was somewhat reverent in testament to the foggy mists surrounding the island, with everyone speaking softly and moving quietly and quickly to position themselves for the events opening the day. The rookery itself was a small island covered in vegetation, some very old and hardy and some relatively new, and the nests of many birds. There were several old dead trees on the island and the entire effect was of a tiered level of birds and bird nests peaking up and out beyond the plant growth of the island. There were several species of birds nesting in apparent harmony. This great birthing spectacle occurs during the winter and spring breeding periods. 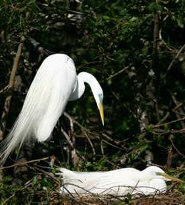 Great egrets, great blue herons and anhingas were the dominant species occupying the majority of the nests. Occasional black-crowned night herons, palm warblers, yellow-rumped warblers and red winged blackbirds were among the other birds identifiable in the area. There were several overhead flights of birds too fast for our unpracticed eyes to identify. The first sounds of the morning from the Venice rookery were anhinga chicks insisting quite loudly for some sort of food or comfort to be provided them. One of the parent birds, apparently an early riser, quickly quelled the cacophony of baby voices. It was surprising how loud they were for such small chicks. Other birds were standing, stretching, and moving wings about as they awakened to a new day. We were expecting the majority of the birds to fly away, but were pleasantly surprised to just watch as they went about a morning "family" routine. 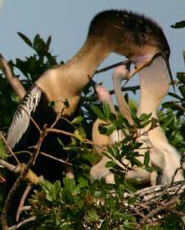 The mothers would stand or rise from the nests, the chicks would move about, and the males would stand by protectively. On two occasions I actually observed the male and female touching bills in an almost affectionate way. The chicks were in different stages of development, as some looked fairly mature while others were very small and looked extremely vulnerable. A few of the anhingas took wing to a nearby tree just above our heads while keeping a close eye on the happenings in the nest area. There were so many nests and birds that it was difficult for awhile to get a focus on any one thing. The overall effect, while almost spiritual in nature, was also somewhat overwhelming. So much to see at one time! Tiny babies, more mature chicks and adolescent birds as well as the parent birds populated the island. We observed one of the parent birds flying to the opposite close shoreline and carefully, very carefully, choosing a stick and taking it back to the nest. It was then presented to the other parent in an almost ritual fashion and just as reverently and carefully accepted and placed in the nest. It was very touching. Each species appeared to have their own rituals and we found the great egrets to be the most memorable. I watched one egret place the specially received stick not in one spot, but moved it three times to be sure it was in exactly the right spot. Through the morning, this ritual continued with the waking, the chicks crying and the feeding. Some birds came and went providing an opportunity to observe their great wingspans, take offs and landings from a fairly close range. We had early morning coffee and doughnuts under the roof of the Venice rookery pavilion while we watched the events unfold. We stayed for several hours, mesmerized by the activity and the beauty of the rookery itself and the area in general. At the apparent busiest point of the morning there were only about two dozen people lined up around the viewing area of the rookery island in hopes of obtaining that one great picture. It appeared that several professional photographers were present as well as a few rookies like us. Everyone was sharing in this remarkable experience. It was such an absolutely delightful and wonderful adventure that we cannot wait to return!